I love this set the colors are beautiful for spring.Lilac and gray is a great color combo.The weight is just right for cool nights. Create a gorgeous, stately look in your bedroom with this comforter set. A lovely floral pattern is beautifully printed on the grey comforter. Matching shams gracefully spread the floral motif to the head of the bed, while the purple Euro shams provide a splash of color. Two decorative pillows feature fabric manipulation and embroidered details that add dimension and texture to the top of the bed. An included purple bedskirt provides the finishing touch for the comforter set. I liked that the set was a complete set. Colors are very pretty - multiple hues of purple, but the background has more grey than white (as the picture appears). The bedskirt falls nicely, but the material of the portion that sits on the box spring is cheap and can easily rip. You do get a lot for the money. 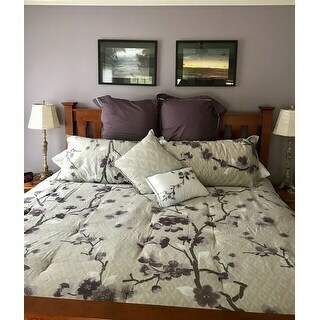 Got this set for our spare room and would rate it 8/10 after having it for a few months Needed a purple comforter to match our new paint job and this color pattern matched well. The color is Grey although it looks white in some pics It’s a lighter weight but keeps you warm Washed easliy and doesn’t wrinkle much Serves its purpose well Comes with matching pillows too Only negative I would give is after a little more shopping I found a completely different comforter set for the same price that was made with better quality materials. Great quality. Comforter is thick and soft. Great price for all the pieces. The European shams added alot of beauty to the set and perfect accent color to the rest of the set and decorative pillows. We are extremely happy with the comforter quality, colors and fit. The reason for the 4 out of 5 rating is, in my opinion, the 2 euro pillows look stupid on a king size bed. Should have 3 offered or none. I have never put euro pillows on any size over a queen so this is a learning experience. Very nice for the price. Love be this comforter set. The purple and lavender colors are muted and it’s more grey than pictured, but I like it better than mostly white comforters. It’s comfortable and soft. It’s tacked in multiple places to keep the inside cotton from shifting during washes. It’s lightweight but still warm enough for winter. The queen size is kind of short across bed. So if you’re looking for more draping down sides go for the king. Set looks great with black, light grey, dark grey, dark purple and lavender sheets. I love this set! Quite beautiful. I used darker purple pillow cases to really highlight the comforter and shams. I am extremely happy with this. Just lovely. The pattern on this is beautiful and I love the heavy weight of the comforter. I did not look or check closely enough the size of the pillow shams before I ordered, so still need to find pillows to fit. Will be beautiful when I get it all together. This has a nice design. The pillows have thin threads, but at least i can take the case off the decorative pillows and wash them. Especially for a guest bed that kids slept in. Material is rough, looks cheap, washed and the stuffing bunch up in sporadic places in the comforter. Very disappointed in my purchase. It looks great and arrived as promised. I am very happy with the purchase. It is definitely a gray background, not beige as it looks in the pictures but I was expecting the gray as that was what was detailed in the product description part. The standard shams do not have a lot of purple flowers on them. They are mainly the gray background and I would have preferred the reverse but still I am happy with the purchase. It is O.K. material is not what I thought, kind of cheap looking, washed in large front load washer on bedding cycle. Internal lining balled up. This comforter is beautiful! Excellent quality. This is the nicest comforter I've ever bought. Was very disappointed, item received didn't look like picture. Was expecting white base color like picture and vibrant purple. What shows as white in picture is Greg and purple was washed out plum color. Love the color and fabric! Its super fluffy and comfortable although it will be too warm for summer. Quality feels really good. It looks just like the picture. The quality is pretty good, however I didn't like the bed skirt. The embodied pillows are really pretty. True to picture. Does haves light grey background as mentioned in several reviews. It's exactly what I've been looking for! The accent pillows have zippers so you can throw them in the wash if needed. The colors are beautiful and I couldn't be happier. This set is quite beautiful! A pale grey background with white and lavender accents. Nice and warm in this freezing winter, this Cal King size adequately covers two twin side by side adjustable platform beds. I love this comforter set. I have had it for almost a year. I was a little hesitant because of the gray. It is more like a muted taupe. "Is the background color more gray or beige?" It is like a pale taupe. If I had to pick, I would say it is more to the beige. Absolutely loved it. 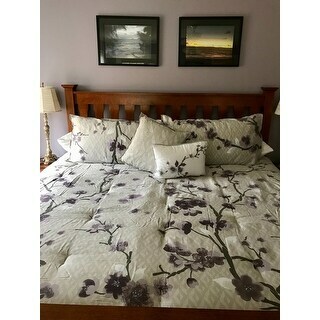 "Love this comforter set Want to know if you carry the Queen Size sheet set First time purchasing from Overstock Very Please Very nice products:)"
Yes, this is available in queen size but doesn't have a matching sheet set. This includes 1 comforter, 2 shams, 1 bedskirt, 2 decorative pillows, 2 Euro shams. "Does this comforter run true to size? I need a queen, but I know sometime people say they ordered a cal king to make it a little longer on sides. Or should the queen size be OK?" "Will this product be in stock as full size anytime?" "Is the comforter soft for sleeping?" I would say yes, I take it off at night but some times during the day I'll take a nap and use just the comforter. I wanted violets but not huge flowers or a pattern that was too busy. This came closest. I was looking for soft colors of lavender this fit the bill, I did get the King for my Queen bed because i do not use the bed skirt. I love the purple look. It is simple, bright, and beautiful.